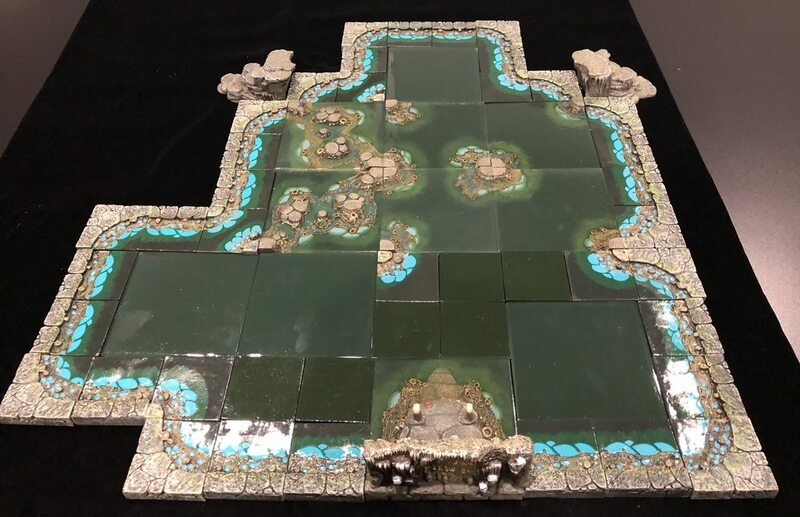 Image of current Dwarvenite and Resin lakes, the open water Dwarvenite is the oddest match. The room lights are causing odd glare/reflections in the photo, they look better matched in person and the blemishes on the resin are not visible, they are actually reflections. I was lucky enough to get one of the Lake Expansion sets! Now that I have replaced my sad delaminated whirlpool, I may experiment with the damaged one more aggressively. Heck, offer the delamintated one for sale to Trogs. You'll get a decent price and somebody will have a whirlpool. Can't imagine needing two anyway. Would love to know how many sets are left! Keep hoping for that email- starting to lose hope. Oh the pain of sinking into a resin whirlpool of despair. But, I don’t actually have a resin whirlpool to sink into, so I’m looking for some alternative... KS5 spiked floor trap? I am amazed how many auctions I have won for exactly my max bid on obscure items where one competitor incrementally bids up to my max and then backs off. It's like magic. As someone who always puts in weird amounts for Max bid (43.87, 109.68 etc) i think often it has to do with people not going an entire bid increment over your top bid. If i bid 109.68 and someone else bids 110 - i win, because they did not exceed by the minimum bid increment. If someone bid $200 they would win with a selling price of 112.18 because 2.50 is the minimum bid increment at 100 dollars. It is a weird algorithm. That is the beauty of snipping software. When a set comes up i am interested in, i go to my snipe software (i use EZsniper) and put in how much i want to pay for it. Then i stop thinking about it. A week later i get a "You did not win" email. On the rare occasion that something slips through the cracks and lands in my lap, i am happy, but for the most part i am bidding low to build a collection slowly over time. I try to never get invested in winning so i don't feel like i lose. Last edited by lostpict on Wed Dec 12, 2018 8:36 pm, edited 3 times in total. Let an old guy get a first set. While I'm sure it is going very slowly per LSB's comment, equally I think forum posters are a small percentage of DF fanatics. Especially with all the new people coming in through KS and streams promoting it. I'm very curious as to how many people registered for the lottery. Is it 75 people trying for 70 sets (or whatever the number was), or is it 500? I would guess that a few hundred registered for the lottery. A good number of the frequent posters on the forums, and those few others who were interested. Folks who are active on the forums also were sure to see the notices about it in the first place. An occasional fan who only stops by every few months could have completely missed it while waiting for KSVI to ship next year.